The whole point of stepping up economic sanctions against Iran was to force it to the negotiating table to try to reach a deal on its nuclear programme. The whole point of going to the negotiating table was that all of the other options - essentially military action by Israel, the United States or a combination of the two - were unpalatable. It might have unpredictable consequences in an already volatile region but more to the point, it would probably only have set back Iran's programme a number of years, even if it had been largely successful. This first series of talks in Geneva was intended to test the water; to establish some basic measure of goodwill; to improve confidence; and to buy time - six months - during which the negotiators can seek to resolve the complex technical issues surrounding Iran's nuclear activities, with the goal of a comprehensive deal that resolves the matter once and for all. So how should we rate the interim deal? At first sight it appears to be a good one - certainly from the big powers' perspective, going further than perhaps many commentators had expected. The entire stockpile of 20% enriched material to be diluted or converted to a form not suitable for further enrichment. This 20% enriched uranium is the feedstock that Iran could use to "dash" towards weapons grade material. In large part this represents a freeze of Iran's nuclear programme, which will essentially be marking time for the six-month duration of the talks. In return Iran has received what the White House insists is "limited, temporary and reversible relief" in terms of economic sanctions. 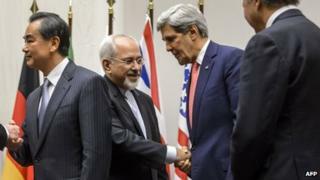 Both the Americans and the Iranians appear to have come away from this interim deal smiling. Both can say that they have received concessions but their practical effect will be limited. The real success here is that the ground has been prepared for further substantive talks. The relief from sanctions has been targeted and specific. The US stresses that existing sanctions will continue to be enforced. Iran is to a large extent freezing any further progress in its nuclear activities but many of its centrifuge cascades have not been operational; it has actually been limiting its enrichment work for whatever reason for some time; and the Arak facility is still some way from being operational. So Iran is not giving up a lot, nor is it gaining a lot. The major powers have got agreement from Tehran for much more intrusive verification and inspection - this could be vital if any comprehensive deal is to stick. They have also been able to insist that all the uncertainties about Iran's past activities - including alleged military aspects of its programme - are going to have to be resolved - again an important pointer for the future. There has though been one important concession to Iran in that it will be able to continue a basic level of uranium enrichment. This is perhaps what has so alarmed the Israelis. Iran of course has always insisted that it has a right to enrich. The US has equally steadfastly refused to accept this in explicit terms. In practice though Iran is unlikely to give up enrichment - certainly not now during this interim phase - and almost certainly not in any future comprehensive deal ether. Over-dramatising the significance of this interim deal does nobody any favours. The Israeli Prime Minister Benjamin Netanyahu sees it as a "historic mistake". Others have argued that it changes the face of the Middle East: Hyperbole on both counts. This is a deal that potentially alters the atmosphere and clears the way for future substantive talks, which may or may not succeed. The Iranian nuclear issue is an important one for the Middle East and the world. Its resolution would remove one potential cause for war. But it would not substantially alter the fact that Iran is now a key regional power. The Americans and their allies saw to that when they removed Iran's long-time enemy - the Saddam Hussein regime in Iraq - from the strategic chessboard. Image caption Israel said the deal was an "historic mistake"
Israel and many of the Gulf Arabs - especially the Saudis - are deeply uneasy about Washington's present course. Issues of policy, trust and mutual misunderstanding are all bound together in an amalgam of anxiety. Can a US administration that baulked when it came to bombing Syria, they ask, really be depended upon to pressure Iran wherever this road may lead? If a nuclear deal is done, will this not effectively acknowledge Iran's growing salience in the region? And what might the impact of reduced international pressure on Tehran mean for other areas of Iranian influence, not least Iraq and Syria ? These are all reasonable questions. But issues of proliferation - especially nuclear proliferation - tend to be seen as a class apart. A nuclear-armed Iran would change strategic calculations in the region dramatically. It might lead to the spread of nuclear weapons to a number of other countries. The Middle East would fundamentally never be the same again. That is why the stakes over the coming six months are going to be so high and the passions so strong.